The history of Stroud congregational Church and the nonconformist tradition in the Cotswolds. The Cotswolds has a nonconformist tradition dating from the C17, particularly in the commercial and industrial centres of Stroud and Nailsworth. 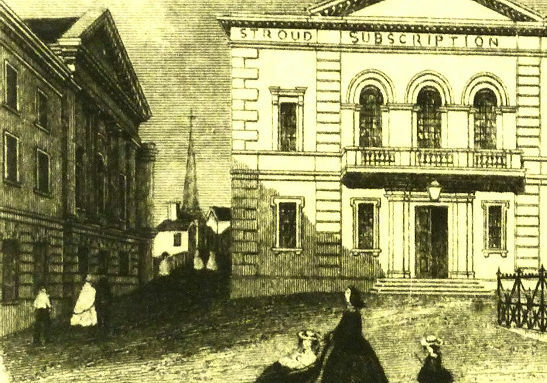 Congregationalists first met in Stroud in the late C17, initially secretly in a barn in Silver Street and from 1711 in a purpose-built chapel in Chapel Street, which due to severe deterioration was demolished in 1977. By the 1830s an additional site for worship was sought and Charles Baker* of Painswick was engaged to design a new Independent Chapel on Bedford Street. 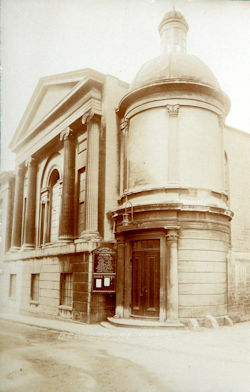 The foundation stone was laid by Samuel Marling on 8 June 1835 and the new church opened as Bedford Street Chapel 27 September 1837 under Reverend John Burder. In February 1851 alterations to the chapel were completed. These included the addition of further galleries to the worship area and the sealing of the three apse window openings, the latter presumably to accommodate the insertion of an organ loft. The other chapel windows were re-glazed partly in coloured glass in 1889. 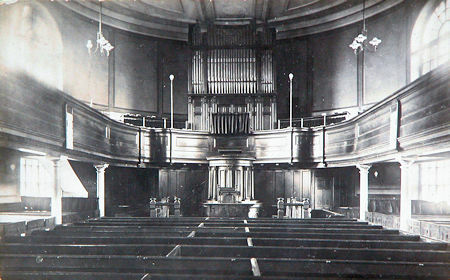 After 1897during the interregnum further alterations took place including the artistic panelling of the walls and ceiling, the erection of a platform below the pulpit and the provision of gas burners. In 1919 the pews were altered, electric lighting fitted and a First World War memorial tablet was erected. During WWII the church was used to house evacuees whilst they were waiting to be billeted out to households. In 1940 150 children arrived from Eastbourne and a plea was sent out for blankets and camp beds while volunteers served food and drinks in the Canteen. The chapel is recorded as having been renovated or repaired in 1870, 1875, 1888, 1897 and 1929. The latest program of renovation finished in 2018 included replacement of the windows with hardwood ones and some masonry repairs. Since the late C20, a lift was installed in 1985 and was in use until 2012 when £25,000-£30,000 was needed to bring it up to modern-day standards, due to lack of funds, a stair-lift was installed on the spiral staircase which is used regularly every Sunday morning. The cupola has been replaced, the church hall refurbished and in 2018 six windows were replaced and masonry repairs were carried out thanks to National Lottery funding, awarded by the Heritage Lottery Fund. The church remains in its original use. * Charles Baker – Surveyor & builder of turnpike roads, Born in 1791 in the parish of Charlton near Malmsbury, Wiltshire, he was apprenticed to Robert Hall of Cirencester, the chief surveyor practising in the area. Baker later made a name for himself as a map maker and architect. His other buildings include the Subscription Rooms (1833),Stroud Workhouse, The British School in Slad Road & Painswick School. Stroud Congregational Church, Bedford Street is Listed as Grade II* and it is a fine example of the Greek Classical Revival style. The interior and exterior craftsmanship are of extremely high quality and use good materials, the exterior is faced in limestone ashlar masonry, the first floor is supported on cast-iron columns made by Jackman & Cooke of Gloucester and the building is flooded with natural light from its large sash windows. Unusually the first floor is used for the Chapel, it is reached by climbing a fine spiral staircase in the circular stair-tower and the fine interior fittings (constructed from Oak and Pine) are a rare, little altered survival from the Nineteenth Century and include a handsome cylindrical pulpit accessed by a sinuous wood and iron stair. It was the first Non-Conformist church building to have its Chapel on the first floor. On the ground floor is a spacious Church Room which was previously used as a Sunday-School. The Independents, sometimes called Separatists, had puritanical roots and were persecuted in the 16th and 17th centuries, because they sought to abolish bishops and archbishops in the Church of England. The Independent movement gained strength during the Civil War since Oliver Cromwell was a member. The first group was led by Richard Fitz in London in the mid-1500s, and the next was formed in Norwich in 1580 under Robert Browne, his followers being termed Brownists, but they are not regarded as the founders of the movement, there being none recognized. Independents were one of the original Three Denominations of Nonconformists and were the forerunners of the Congregationalists. They believed in the free association of Christians into congregations which picked their own minister and conducted themselves independently of the authority of any overseeing body. Theological beliefs differed between members and between congregations. Congregationalism gained a more defined theology during the 19th century but they were still independent of any formal association. The terms Independent and Congregational came to be synonymous in the 17th and 18th centuries, but a confusion arises as some Presbyterian churches were described as' 'Independent with the meaning that they were independent of the Anglican church. There were about 59,000 Congregationalists in 1700 and numbers declined during the 18th century. However, the Methodist revival in the late 18th century benefitted them and numbers rose again. There were about 1500 congregational chapels in England, and a further 500 in Wales, in 1850. It was popular with the Victorian middle class as it had many social activities as well as spiritual guidance. What does the Congregational church believe? Congregational Church Christians believe in the spiritual equality and priesthood of all believers. In practice, this means they hold to the Bible and belief in Jesus, but individual members have "the full liberty of conscience in interpreting the Gospel," according to The Art and Practice of the Congregational Way.